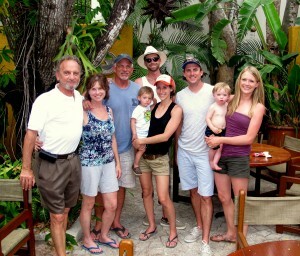 We first took a Cozumel vacation over twenty years ago, and we’ve been returning ever since. Our first place we stayed at was the Reef Club (currently Sabor Cozumel Resort & Spa). We stayed at other resorts over the years, but we never found a resort we liked as much as the Reef Club or the south side of the island. Because of our frequent visits, we invested in a timeshare at the Reef Regency Club and we loved it. We were invited to view the plans for the new Residencias Reef Condos. It became a very easy decision to purchase a unit and own a “little piece of paradise”. We bought our first one bedroom condo (Casa Del Amor, 8340) in 2005, then an opportunity came up that allowed us to purchase a second one bedroom condo (Casa Vista Hermosa, 8310). Soon after that, Hurricane Wilma hit and delayed construction for over a year. Our “little piece of paradise” was finally completed in 2007 and we were confident at that time it was a great decision. We purchased our third condo (Casa Buena Vida, 5120) and completed full renovations March 2010. We also manage a condo (Casa Gonzalez, 7330) for a friend who’s family is part of the history of the island. We invite you to come and experience the beauty of the Isle of Cozumel and the friendliness of the people. You will fall in love with the island and the people just as we did. Please be forewarned that you will likely get hooked and want to return as you will be hungry for more of the “laid back” feeling you acquire on your vacation with Cozumello Vacation Rentals! Thank you for considering us in your travel plans as you look for your Cozumel vacation rental. We hope you enjoy our condo(s) as much as we do! We take pride in what we offer our guests and hope you feel at home during your stay!